SKU: 5015601540953350 Category: High Waisted Plus Size Bikini. Tags: Beauty, Category, Compression Level, Fashion, Midsection, Simply Slender, Solution, Strong, Waist Slimming, Womens. A body cream is a wonderful option for those of you who are tired of waiting to see results from your shape-up plan. 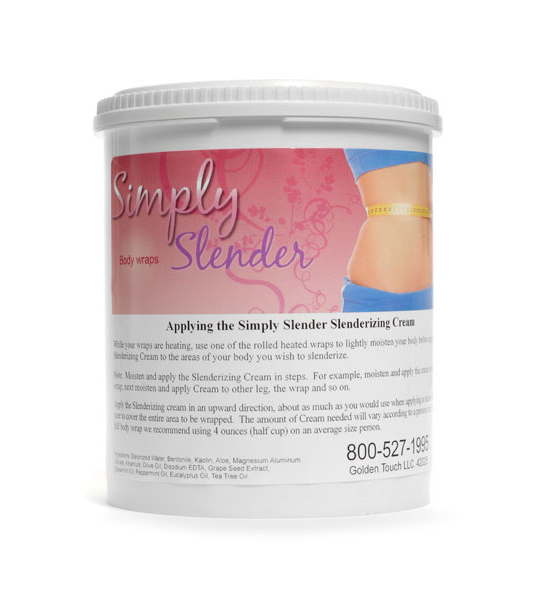 When you’re ready to shape up right away, the 32 Oz Slenderizing Cream by Simply Slender is cream you can turn to. If you’ve tried to lose inches, you already understand how trying the process can be for your patience. Whether you’re ready to reduce for a special occasion or for everyday, using this cream for body wrap with your Simply Slender products is all you need to create immediate slimming anywhere you apply it. Note: Read and follow all included directions to achieve optimal results. Results are not guaranteed. The Simply Slender Slenderizing cream is formulated from a special blend of herbs, clays and minerals. You’ll love the smell and feel of powerful ingredients like Olive Oil, Grape Seed Extract, Spearmint Oil, Peppermint Oil, Eucalyptus Oil and Tea Tree Oil. You apply this formula directly to the body prior to wrapping with High Quality Cotton Elastic Wraps from Simply Slender and wearing the slenderizing suit, both available as part of a Simply Slender body wrap kit. Regular usage of the Simply Slender Slenderizing cream according to the product’s instructions is one powerful technique you can use to create a slimmer silhouette. FEATURES Use with High Quality Cotton Elastic Wraps from Simply Slender Tea Tree Oil Eucalyptus Oli Peppermint Oil Spearmint Oil Grape Seed Extract Olive Oil 32 ounces of Simply Slender Slenderizing Cream RESULTS Rejuvenated appearance Measurable loss of in the applied areas Ingredients: Deionized Water. Kaolin. Bentonite.